73 days until the London marathon. This past weekend I had a long-planned hill race on Saturday, and then a long run scheduled for Sunday. The hill race was a relay, and together with a colleague I slogged through the wind, up the hills, and across the saturated ground for our ~ 6 mile leg. Thankfully, there was split-pea and mint soup, rolls, and cake at the race headquarters afterwards. I was tired, but not too beat up, and so I thought my scheduled 18-miler on Sunday would be doable. On Sunday, I faffed. I wanted to rest in the morning and recover from the race. My 18-miler, the longest run of the training cycle thusfar, would take me close to three hours, so I couldn't do it in the morning, as I had to take my daughter someplace at 10 a.m. Prior to this, I popped a pot-roast and vegetables into the oven for Sunday lunch. After lunch, I stretched out on the couch. It was raining and windy outside, again. There was the newspaper to read. And this interesting book that my wife gave me for Christmas - The Story of the Human Body. My son wanted me to continue reading a bit of The Two Towers to him. My daughter then went off with her friends. My wife took my son to see a local castle. It was 3:00. It started raining one mile into the run. I had used google maps to measure out a 9 mile loop, and planned on running it twice. The loop was hilly, but mostly on farm roads, so there wasn't much traffic. I was sore, so I took it slow on the hills. 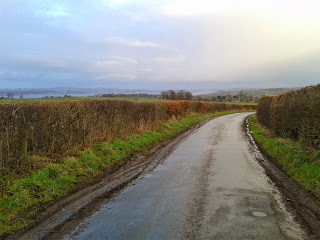 At one point, I had a view out to the Firth of Forth, and stopped for a photo. After the first lap, I took a sip of water from a water bottle that I'd stashed in a tree near the start of the run. I also had a chocolate chip cookie. It became dark on the second lap, but I didn't really struggle until the last two miles. At that point, I took a few walk breaks so that I could recover more quickly from the run. And then it was done! With 7:16 of running this week, it had been my biggest week so far.